Recently, the owners of THEGIANT.ORG have been in communication with Daniel Lahoda ("Jet-Set Graffiti" of the gallery by the same name). That communication is re-printed below. Please read through it and I will re-join you for additional commentary, below. Whereas it was my pleasure to meet and hang out with you both at my sponsored event with Ron English at Gallery XIV in Boston on July 2nd, I am now contacting you in regards to a most serious issue of defamation that seriously affects my business, and has caused considerable damages. I would not be contacting you without proof of this defamation and my willingness to take legal action against all responsible parties. As of the writing of this letter to you, I have sought legal counsel to protect my rights against continued defamatory statements made on your web-forum. I am a fine art dealer/publisher with licensed legal corporations in New York, Nevada, and California. I operate my business and life with the utmost integrity. I take responsibility for my actions both personally as well as professionally. Recently, my integrity has come into question in regards to a supposed private debt to an anonymous member named 'TJWalker', who has been active on this board. I have defended myself insofar as making legally binding public statements that these allegations are false, and hold no merit. I do have proof of their falsehood that can and will be presented to the authorities should the question arise in a formal and legal forum. I am legally protected from the need to publicly present this information to maintain my unsolicited innocence. The fact that 5 months have passed since these allegations have been made, without any legal action taken against me or my business is further indication that these allegations are spurious. Regardless of my public insistence in denial of these allegations on this forum, certain other self-proclaimed 'senior' members anonymously referred to as 'DZEL' and 'RobotOil' have maintained an illegal campaign of defamation and libel against myself and my legally licensed corporations; JetSet Graffiti, LLC and Lahoda Fine Arts, LLC. They have made libelous and defamatory statements on a number of threads to which I have willingly participated. These threads are monitored, edited, and censored under the auspices of yourselves as owners of this public forum. These 2 members are now actively engaged in 'following' me and continuing to issue publicly defamatory statements that "JetSet Graffiti = Fraud Artist" and "Daniel Lahoda = Fraud Artist". Both statements are untrue as of the dates of publication on this public forum, and will remain untrue indefinitely. They collectively have joined in maintaining these allegations, whereas the original poster has abandoned his insistence of publicly maintaining said allegations. Instead, the anonymous member, TJWalker, has relied on Private Messages to RobotOil as an extremely active and trusted member and monitor of my posts to maintain these illegal allegations in a public manner. These allegations have made considerable damage to my reputation and business as a legitimate art dealer and limited edition publisher, with physical gallery locations in Los Angeles, and Brooklyn. I am hereby insisting that these illegal and publicly viewable statements be rescinded from publication on this and any site owned by yourselves. I do believe you operate this site as an educational and informative source for documentation on the genre of art that we are all extremely passionate about. I do not believe that you care to be party to any forthcoming investigation or lawsuit pertaining to these issues of defamation against myself or my company. If you agree to remove all defamatory content, I will provide a complete listing of all threads and posts with the aforementioned illegal content. I understand that there exists a difference between opinion and defamatory libel. For your own edification of your liability in these circumstances, I urge you to research the issue of internet defamation and its current legal precedent in the court system in New York, Rhode Island, and California. I do continue to wish you the best, and I await your reply to my concerns. I have copied attorney Eric Syverson, of http://www.syversonlaw.com/, an authority of internet business and e-commerce law, this letter of my concerns. If this request is not met, we will be forced to take legal action to repair any and all damages made through this negligence as the owner/operators of this publicly viewed forum, where threads and statements are monitored and censored willingly by yourselves, or appointed moderators. This solicitation to remove all spurious defamatory and libelous content against myself and my businesses has been sent in confidence and your cooperation in maintaining its privacy is appreciated and duly noted. Pursuant to your request, dated December 1, 2008, we will remove the threads indicated in your letter from public view on THEGIANT.ORG (“the site”). The material contained within those threads will be retained should future civil or criminal action warrant its release. Your letter will be posted publicly on the site as explanation for the material’s removal, as will a copy of this letter. Additionally, all material pertaining to the promotion of your business, Jet-Set Graffiti, will be removed from the site. And as it is not incumbent upon the site, its owners or administrators, to provide you with access for further business or self-promotion, your account and all privileges associated therewith are hereby rescinded. Any further communication with the site, its owners or its administrators, should be conducted through retained counsel via the addresses already in your possession. In it, he's claiming a lack of legal action against him is proof of innocence, but it's not. In it he's claiming the fact he works with artists proves he isn't a fraud, but it doesn't. Still, as this is a litigious society and one can file suit for any reason at all, valid or otherwise, we felt it best to remove all previously-posted references to Mr. Lahoda and his business dealings from the site. As is noted in our response to him, above, that material has been retained should future criminal or civil charges warrant its release. 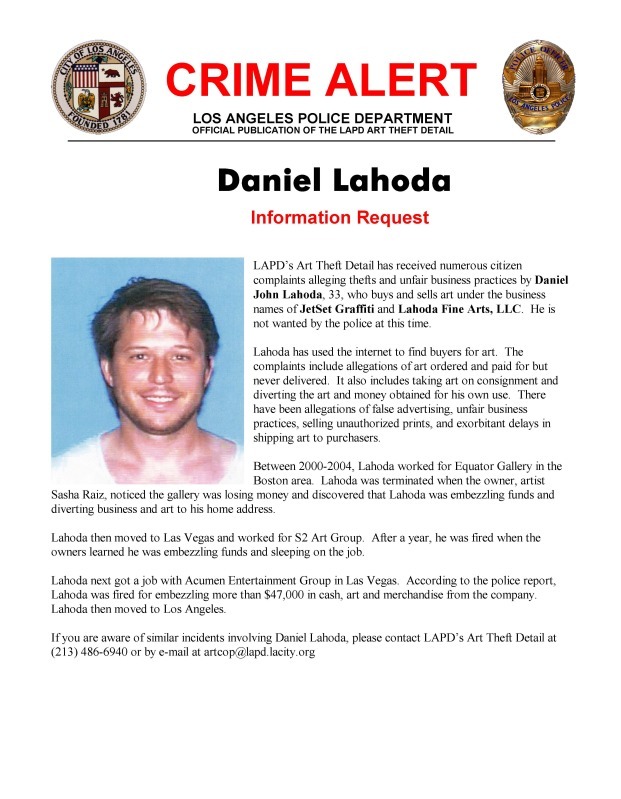 Parties with interest in civil or criminal action against Mr. Daniel Lahoda, Jet-Set Graffiti or Lahoda Fine Arts, LLC may request access to this information through their retained counsel or by valid court order directed to the owners and administrators of this site. Many of your posts were caught up in the sweep of "Lahoda Material," and for that we apologize. It was a regrettable reality that it had to be done. No further discussion of Mr. Daniel Lahoda, Jet-Set Graffiti or Lahoda Fine Arts, LLC will be permitted on this site without first notifying the site's owners and administrators of your intention and the discussion's content, and obtaining approval prior to posting. Failure to notify the site's owners and administrators and obtain permission prior to posting information regarding Mr. Daniel Lahoda, Jet-Set Graffiti or Lahoda Fine Arts, LLC will result in your post's deletion and resulting warnings and forum suspensions. We apologize for this as well, but it is another regrettable reality. Daniel Lahoda decided to rejoin the forum under the name "OCELOT," an account which was then used to promote Jet Set Graffiti-distributed prints. All posts and threads created by Daniel Lahoda under the name OCELOT have been removed into storage alongside the previous Jet Set Graffiti posts. Once again, a few of your-- the general membership's-- posts were caught up in the sweep of "Lahoda Material," and for that we once again apologize. It was a regrettable reality that it had to be done. Apparently Daniel Lahoda needs us more as a sales venue than as a punching bag for his legal threats. He also apparently needs his membership more than we need him as a member. As such, his OCELOT account has been shown the door. Daniel Lahoda decided to once again rejoin the forum, this time under the name "Silverbak," an account which was then used to promote Jet Set Graffiti-distributed prints. All posts and threads created by Daniel Lahoda under the name "Silverbak" have been removed into storage alongside the previous Jet Set Graffiti posts. Once again, apparently Daniel Lahoda needs us more as a sales venue than as a punching bag for his legal threats. Once again, he also apparently needs his membership more than we need him as a member. As such, his "Silverbak" account has been shown the door. Daniel Lahoda decided to once again rejoin the forum using an account which was then used to promote Jet Set Graffiti-distributed prints. All posts and threads created by Daniel Lahoda using the new name have been removed into storage alongside the previous Jet Set Graffiti posts. As such, Lahoda's newest account has been shown the door. Daniel Lahoda, it seems, has trouble understanding the concept of "you are not welcome here." Perhaps if he hears it enough times, from enough people, in enough places, it will finally sink in. i received the following email recently and was asked by the sender to post the information here on the forum. the same information has been posted on other art forums, and daniel lahoda is aware of the investigation. as always, please refrain from discussing daniel lahoda or jet-set graffiti here on thegiant. those who break this rule will be warned; repeated offenses will result in the user being banned. as always, thanks for complying! I am a detective who handles art theft and art fraud investigations for the Los Angeles Police Department. I am conducting a criminal investigation involving Daniel Lahoda who goes by the business names of Lahoda Fine Arts and Jetset Graffiti. I am trying to locate anyone who believes they may have been defrauded by Daniel Lahoda. In searching the internet, I noticed there was a thread on TheGiant.org forum in 2008 regarding Lahoda and possible questionable business practices. If you are aware of anyone who feels they have been victimized by Lahoda then I would encourage you to have them contact me. I can be contacted at (213) 486-6954 or by email at artcop@lapd.lacity.org. please note that lahoda is suspected to be selling on ebay under the username crackandpeel1.